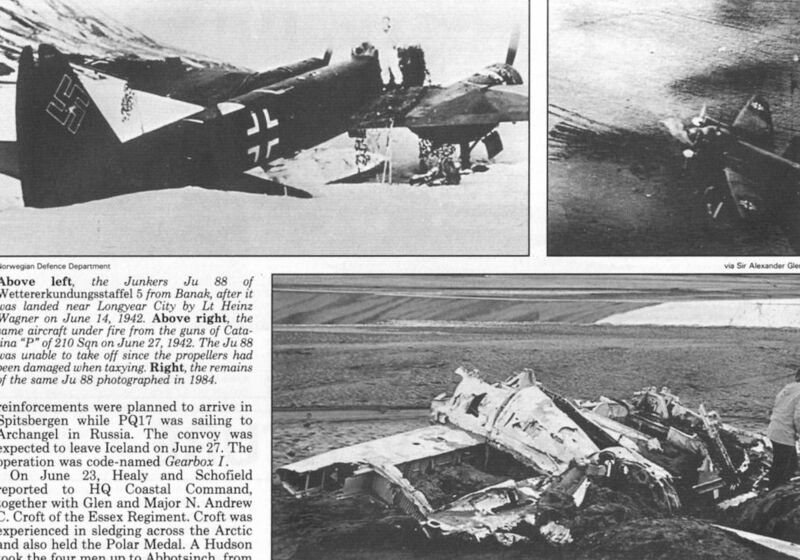 Top left, the Junkers Ju 88 of Wettererkundungsstaffel 5 from Banak, after it was landed near Longyear City by Lt Heinz Wagner on June 14, 1942. Top right, the same aircraft under fire from the guns of Catalina “P" of 210 Sqn on June 27, 1942. The Ju 88 was unable to take off since the propellers had been damaged when taxying. Bottom, the remains of the same Ju 88 photographed in 1984. A Catalina IVA of 210 Sqn equipped with a Leigh Light under the starboard wing for illuminating U-boats detected at night. This photograph of JX574 was taken in 1944, after the squadron was reformed and again based at Sullom Voe.